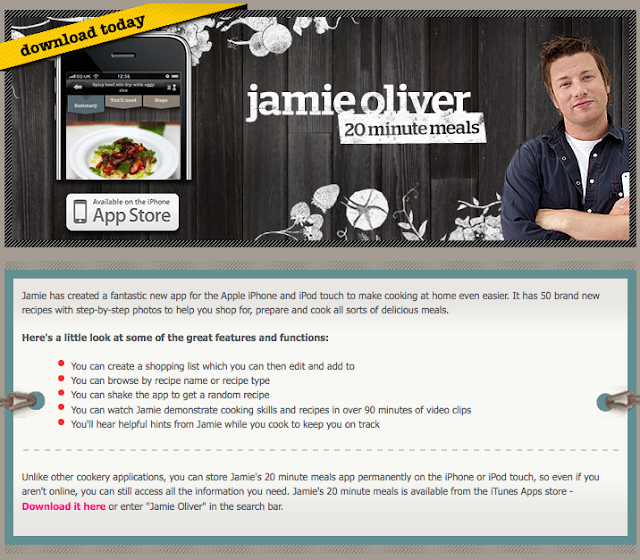 krismulkey.com: Jamie Oliver iPhone App "20 Minute Meals"
Jamie Oliver iPhone App "20 Minute Meals"
Don came home the other day and told me he downloaded the Jamie Oliver iphone app which is 50 recipes that you can prepare in 20 minutes. Awesome. 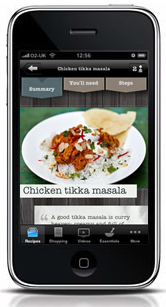 The recipes are listed by category. He includes detailed instructions with lots of pictures. He even has a feature that creates a shopping list. I checked it out at work right before I was heading home. Selected a recipe and took the phone/shopping list in the store with me to make sure I didn't forget anything. The only thing I will do different next time is to adjust the auto lock setting so it leaves the recipe open while I'm cooking. That way I don't have to keep touching my phone. The recipe I made was Pasta with Sausage and Zucchini. It was delish. I can't wait to try another one. This is my FAVORITE pan. It works so well for everything. I mix everything in my big pan, instead of a bowl. It's just easier. Ta da! Time to dig in.